This is not an indoor pool, no. 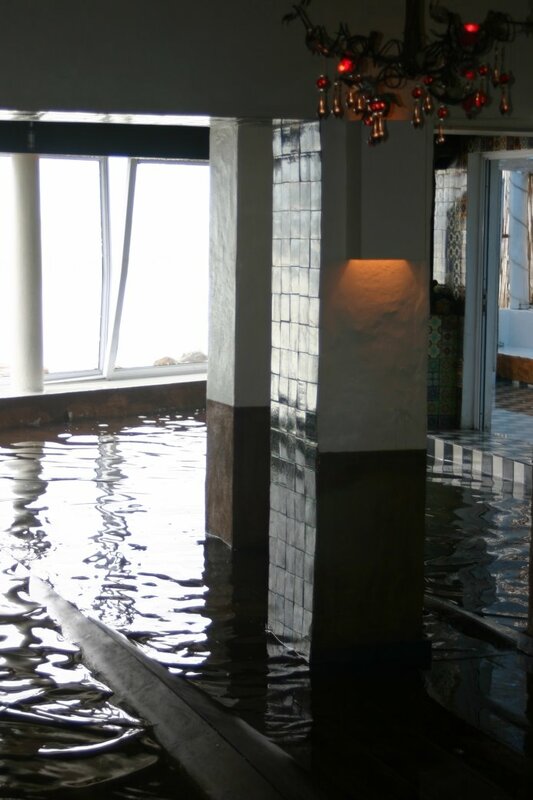 It's the interior of Polana, a restaurant at Kalk Bay harbour, after huge waves struck the area earlier today. Windows broke, tables floated out into the harbour, and as you can see, the restaurant was completely flooded. There are more photos here and here. The Zoopy crew apparently took plenty of video footage, so we'll let you know as soon as that's been loaded onto their site. You can read reports of the storm damage throughout the Western Cape here and here. Thanks to the guys and girls at Zoopy! Update: There are some fantastic photos of the giant waves in Kalk Bay on Luke Hardiman's blog. You can compare those with these: Kalk Bay harbour when it's not stormy. Posted in General on Monday, 1 September, 2008 by Kerry-Anne.